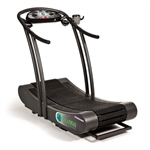 SportsArt 6310 HR Club Series Treadmill, SportsArt Treadmills are known for their unique design and pleasing aesthetics. Looks aren't everything, though. These are high performance machines that feature precision SportsArt-built motors, the most powerful lift motors in the industry, and multiple workout options that add variety to any workout. Belt Size - 20" x 62"
Display Tri-Color Dot Matrix, 4 programs, 2 Custom INTV, 2 HRC, CardioControl™Display, Quick Start. Programs Include College Track, Bay Run, River Run, Climbers Trek, Rocky Ridge, White Pass, Heart Rate Control Weight Loss, Heart Rate Control Cardio, Fitness Test, Manual.